This is what I see on some of my desktops: I use CTWM a lot, and if I have only one screen, this is how it's often set up. The ugly pink and yellow (and one dark blue) blocks in the upper right are actually the pager. Since I use tabbed window titlebars, the pager is almost never covered. The menu is top center. I've added some of my own buttons. 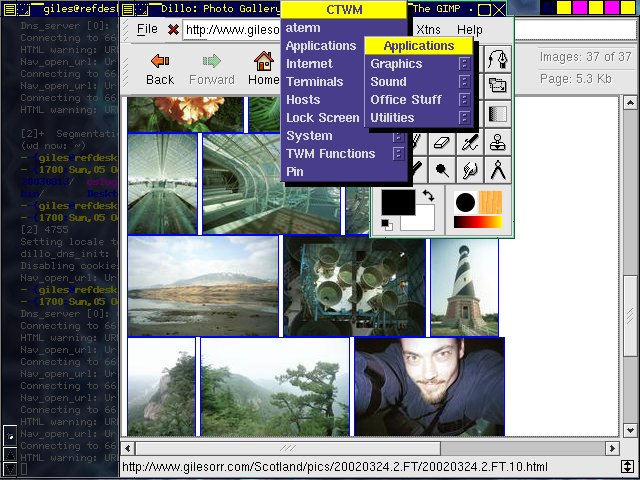 ClearBlue theme from the CTWM site. Menu on the lower left, pager lower right, icon manager in the upper right. Notice the very different appearance, the different buttons. 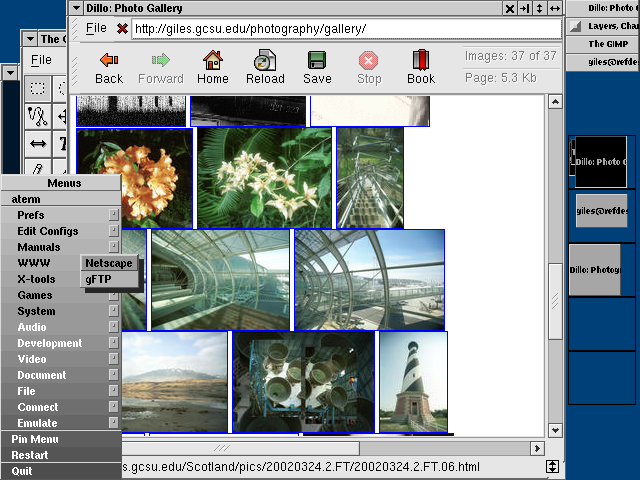 I used version 3.6, which is the most recent version as of October 2003. The man page is extensive and excellent. Like twm, it's dense and you'll have to work at it, but it's all there. CTWM is an extension of TWM. I think the original intention was primarily to add virtual workspaces, but a great deal more has been added. Particularly for appearance, but some behavioural additions have been made as well. I really like CTWM. It has flaws, and it does things in an old-fashioned way (it's TWM heritage), but it's flexible and stable. It's greatest flaw to most people will be that you'll have to put a lot of time and energy into editing the config file if you don't like the defaults (or one of the provided themes). There's no graphical configuration for this one. But you can set almost any appearance, any kind of button on the window frames with any kind of functionality, and you can bind keys to do whatever you want. Small, very flexible in appearance and behaviour. Some annoying hangovers from TWM. Some activity still exists on the mailing list.